The oddsmaker opened this contest with the Cavs favored by 4.5 points over the Boilermakers. Each team had a battle on their hands in the Sweet 16 with Purdue needing overtime and Virginia prevailing over Oregon after the Ducks rallied to tie the game with inside of 4.5 minutes left. The NCAA odds board has the Cavs as the 4 to 4.5 point favorites with a total line of 125.5. Read on to get our prognosticator’s play on this game. Two fantastic defensive clubs take to the floor at the Honda Center in Anaheim on Saturday night when Gonzaga and Texas Tech tip off at 6:10 PM ET. The team with the better offense will be the key to this game and on paper the Bulldogs certainly do stand out in that category. See Dan’s take and get his against the spread prediction. Both teams have been solid against the spread recently, with the Tigers going 6-4 and the Tar Heels going 7-3. An interesting trend shows that the Tar Heels play great basketball after coming off a win by 20 points or more. They are 9-1 straight up and 7-2-1 against the spread. As for Auburn they are 5-2 straight up and 4-3 ATS when they win their previous game by 10 to 19 points. Obviously every team still in the tourney is coming off some kind of high, as losers go home. But which team truly has momentum? Matt Lowry breaks down the matchup and the sportsbook’s spread of 5.5. 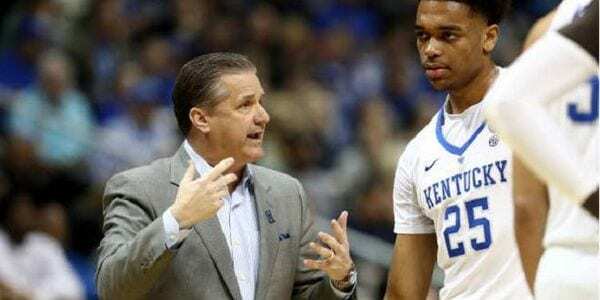 PJ Washington remains sidelined and is listed as questionable for this Sweet 16 game. Without Washington, Kentucky had just two double-digit scorers in the game against Wofford, which is a huge concern especially against a defensive-minded team like Houston. Sportsbooks seem to agree making the Cats only 3 point favorites. Matt Lowry gives his college basketball prediction. Remember what Bill Simmons has fondly said: always beware of the “nobody believes in us” team. LSU has taken that status and run with it so far, winning two games by a combined six points against Yale and Maryland to overcome losing its coach and reach the Sweet 16. It’s the 30-year anniversary of the last time an interim coach won the national title (Michigan’s Steve Fisher), and the Tigers appear to have rallied around coach Tony Benford and their chance to silence their critics. Does that create an opportunity here betting LSU against the spread at +6? DJ gives his basketball pick!